Nursery rhymes are a great way to engage young children in reading and listening to books. They’re typically very short which is perfect for short attention spans. The rhymes make them easy to memorize so little ones can “read” along with you. And, they are a natural way to introduce beginning literacy and math skills. Jack Be Nimble is a fun nursery rhyme for little ones. And, this 6-page mini pack is perfect to use alongside that rhyme. In this learning pack, you’ll find a poster of the rhyme. Laminate it and hang it on the wall for kids to “read” over and over again. 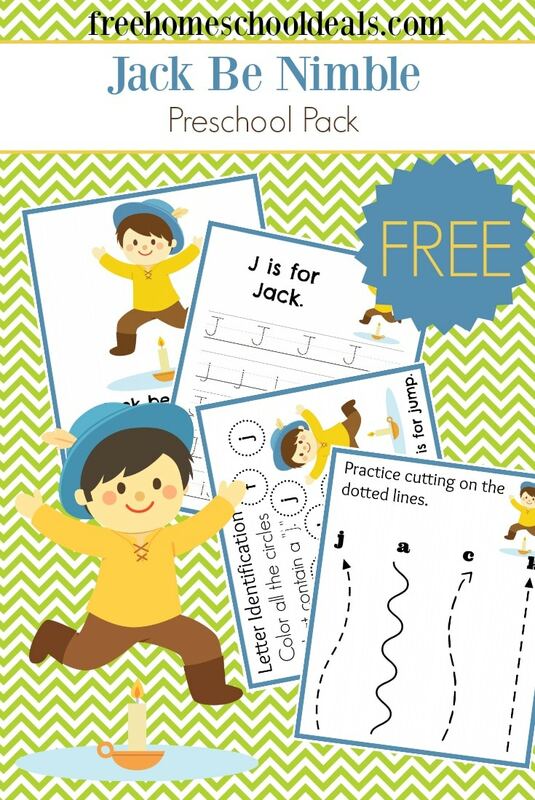 Then, let them practice their handwriting with the Jj is for Jack practice page. For more letter practice, kids can use dot markers or crayons to identify all of the j’s on the page. Creative kiddos will enjoy a fun coloring page. They can use the poster as a model or be completely creative. Then, they’ll work their fine motor skills as the practice cutting on the lines. Wrap up your lesson with one more dot marker page.